Many of you should have experienced the joy and enthusiastic reactions your Chihuahua displays when they can see you are just about to give them some of your left over dinner or a piece of meat from your weekly takeaway. We all feed our dogs dry kibble but some owners will feed only dry food mainly due to the convenience of just having to poor it into a bowl so spare a thought for your little one and get creative with their meal times as a little effort will light up their day. Feeding a top brand dog food is not cheap nowadays which is why we are so passionate about getting value for money here at Chihuahua World being as we have many dogs, our real meat food is bar far the best hands down but this takes a lot of time and effort as you can see by viewing our Real Chihuahua Food Videos here. If this amount of time is not what you can invest in your Chihuahuas meal times then try some of the tips below especially if you are not feeding one of the top brand dog foods as we show you some great tips to enhance their meal times even on a budget, watch your dogs reactions when you feed them this so you can see the appreciation for your efforts. Let's start with a topic affecting most of us today and that is the amount of food we waste everyday due to "sell by" and "use by" dates, whilst some of us realize that most of the time some of these can be ignored there are also too many people, especially the younger generation, that religiously stick by them which obviously leads to too much food being thrown away if the date is reached before consumption. The same goes for meal time left overs, the food that has been cooked is still perfectly usable for a couple of days if kept refrigerated or even longer if frozen but for ease it is normally scraped into the bin, just before you do stop and think about your dogs meal times, get yourself a few air tight containers and fill them with your left overs, it doesn't matter if they all mix together as what may look unappetizing to us will be a real treat in your dogs eyes. The out dated food that has to be cooked you need to cook immediately and then use or freeze it or if it doesn't need cooking then the same applies, use it of freeze it. If it smells OK and hasn't got anything growing on it (fungus) then generally it will be just fine for your dogs. Get Creative, Buy a Food Processor! 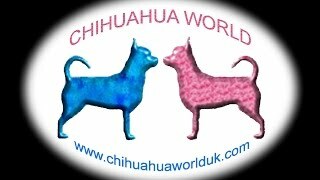 Pretty cheap in today's world are Food Processors which will become a huge part of your Chihuahuas feeding program if you try out what we show you here, they can be purchased new for as little as £20. Blending your unwanted food creates a complete meal in the form of protein, carbohydrates, fats etc so don't be afraid what to blend as they will all contribute to providing a healthy balanced diet for your Chihuahua which will be mixed in with what they are used to, their dried kibble that you normally feed them. If you are saying "well i also feed them a tinned food in gravy" then we recommend that you save your money as these are expensive and rarely contain what would be described as a balanced meal, remember that most all pet food manufacturer's businesses are based around maximizing profit so cheap food will mean cheap ingredients, and even if the food is expensive, most of the cost is made up of their labour and profits which will always mean you can make the same quality meals at a fraction of their cost if you are willing to put a little of your time in. The video below gives you a few ideas of what you can do with your food, your Chihuahua's food and a Food Processor. We highlight that using a dry kibble needn't be an expensive brand if you combine it with the results from a food blending session, of course you do not need to use a kibble at all if your family produces more food waste than your dog can eat so you are able to cut out the kibble all together. Dog food is NOT a necessity for your dog so don't be fooled into thinking just because it's made for a dog they have to eat it, the base ingredients are all by products of human food and processed into little dry biscuits.